Our Sustainable Development team have come close runners up in two categories at the national Sustainable Health and Care Awards. Promoting healthy, resilient, energy-efficient and sustainable healthcare services, they were highly commended in two categories. In Travel and Logistics they were recognised for their outstanding health and wellbeing walking projects for staff and patients, “Lets walk North Bristol” and lunchtime walks. 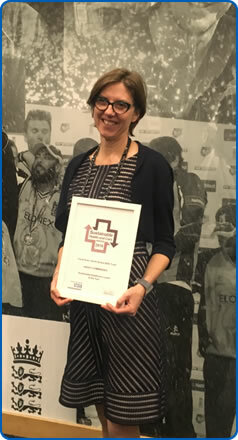 Also in Sustainable Healthcare Leader of the Year, Head of Sustainable Health and Capital Planning, Tricia Down, was recognised for her contribution to sustainable development.